Hi, I’m Thomas Ralph, and I’m a conference seminar facilitator. I’m here to talk about engagement. OK, so why should you care? Well, many of you may have sat through a seminar in the past and wondered why you were there. The facilitator might have been reading his slides (in a boring tone), and you might have had half your mind somewhere else. But what went wrong? Perhaps the facilitator just wasn’t engaging enough. If you’re going to present in the future, what might you do to make things go a bit better? I think that engagement is all about making an emotional connection. Make yourself and your seminar interesting. Imagine the audience hanging on your words and wondering what you’re going to say next. How can you make that happen? Stories are really engaging and give the audience a chance and a motive to connect with you. In fact, we in the Conference Presenters project think they’re so important that we’ve got a whole article on the subject lined up in the future. So that story’s going to have to wait for now. For the average judge, the first thought of a seminar presentation is the set-up from university. A lecturer, standing at one end of the room behind a podium, possibly up on a stage, reads from a laptop computer. All communication is one-way. The lecturer is talking at a room full of students, most of whom say nothing and write furiously (or sleep). Don’t they say a university lecture makes the notes of the lecturer become the notes of the student without passing through the minds of either? It’s natural that this is how think you should set yourself up when you come to hold your first judge seminar. But it shouldn’t be – why disconnect yourself from the audience before you’ve even begun? Get out in front of the podium, walk around, look at and keep eye contact with your audience. They’re not going to throw anything at you (I promise) so don’t put up the barriers before you start. Notes are another kind of barrier, particularly if they’re excessive. The judge program doesn’t expect you to learn your entire seminar off by heart, of course. But if you have a bunch of A4/letter pages in your hand while speaking, not only will you lose your place, you’ll also tend to wave them around, rustle them, and distract your audience from what they’re trying to pay attention to: you. Keep your notes short and simple. Use note cards: A6 or 4 by 6 inches is an ideal size. It’s not a speech, so only put down the main points you want to get across. Alternatively, if you’ll be able to refer to it unobtrusively, store your notes in the “speaker notes” section of your PowerPoint/Keynote slides, and use the Presenter view to keep them on display (more about that in the next section). If you’ve followed the suggestion of getting rid of the barriers as I mentioned earlier, you’re already half-way to getting physically closer to the audience. Within physical limitations, try to (a) shorten the distance between you and the audience, (b) keep the audience members together rather than spread out all over the room, and (c) remove barriers that create distance between you and the audience. This can be both physical and perceived distance. If you can, position your laptop or monitor low down but in your eye-line, so that you can consult it unobtrusively. Don’t feel that you have to stick to the room set-up you’ve been given. Use as much of the room as you can: walk around. Avoid hanging on the one spot or rocking back and forth). Try not to cross in front of the projector unnecessarily, but staying in one place, especially if it’s too far back, can be disengaging. I mentioned perceived distance – by this I mean things like the language and register (the type of words) you use. Most judge seminars will be very informal and you don’t need to use formal or highly respectful language. But it’s worth knowing your audience and avoiding, for example, the use of old or slang terms, or assuming that your judges are familiar with current deck archetypes or the Oracle text of cards. If you’re going to have a highly technical seminar, then perhaps handing out some notes or references beforehand might help — but do this with caution because the audience might wind up reading them instead of listening. It’s most useful when you’ve got some important information that you want to give out but it doesn’t quite fit your story, or is high on data and numbers. If you’re using breakout sessions (about which more later on) then make sure you go around the different groups to pick up some of the ideas that come up, so that you can make reference to them later on if they get missed in the plenary. You can do this before your seminar as well: get opinions from delegates on what they’d like to hear. To go with getting physically closer, also consider how you will get closer to a meeting of minds with your audience. Rather than diving right into your talk at the start, consider giving a little agenda of what you’ll be covering. This way, if someone is disengaged or disconnected from a particular topic, at least they’ll know that there’s something else coming up which will interest them more. It’ll also help a lot with structure and planning. Make the seminar personal. Share a couple of stories about the way you’ve done things in the past. Make them humorous if you can, and don’t be afraid to share a fail as well as success. This helps people to connect with you personally. Humour is a great way of connecting with and engaging your audience. It deserves special mention and caution in the context of judge seminars, though – humour often doesn’t translate too well, and if you’ve got a lot of nationalities in attendance you might inadvertently give offence. Try to make the seminar about the other participants rather than about the facilitator. There’s a reason I don’t call them presenters, or speakers, or leaders, by the way. The person up front is there to facilitate discussion. There’s going to be someone in the audience who knows more than you, someone who disagrees with you, and someone who’s got an opinion that’s different to yours. Those people are an opportunity to demonstrate your engagement even further. Use them. Invite challenge. Ask for questions. Get other opinions. Be prepared to take suggestions and different opinions. The other people in the room are more than your audience. They are a resource. Try to find time to make audience participation a part of your seminar. It might simply be a case of putting up a topic on screen and dividing everyone into groups to discuss for 10 minutes and report back. Or it could be more advanced, such as asking everyone to come up with something they might like to change about a tournament process. Breakout sessions are a simple way of engaging the audience and getting people involved. A slide changer (aka remote control, clicker) is a 100% indispensable tool to facilitating a really great seminar when you’re using presentation software. It can be held in one hand and used to click slides onwards and backwards. It completely removes the huge distraction caused by you wandering over to the computer, usually in front of the projector, and stabbing at the right arrow or Enter key. If you’re running a judge conference, please get one. I recommend the Logitech Wireless Presenter series which can be purchased for around $40. It connects via a USB dongle and works on pretty much every operating system. 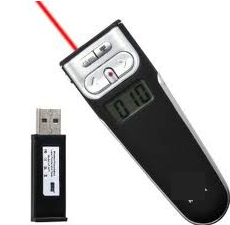 Most slide changers also have a laser pointer built-in, which you can use to highlight or bring attention to particular items on the slide. This is far preferable to pointing with your finger. Note that it only works if you’re using a projector – if you’ve got a plasma or LED/LCD screen, the laser will reflect off it and be invisible. The Presenter view is a hidden gem of presentation software. While the full slide displays on the screen the audience sees, on your laptop (or, if you set it up properly, your tablet or smartphone), you can configure the system to show your slide at about half-size, plus the next slide(s) and your personal notes. It can also show a clock so you can keep track of time. This is a really great way to remind yourself of some key points without having to dive into notes, to plan ahead, and to make sure you don’t run over time. We’ve got a separate article coming up about putting together great slides, so I won’t spoil that one. I hope you’ve found this useful. Just like you should finish your seminar with a call to action, I’d like you to try some of the things I’ve mentioned here and let me know. Also, if you need to learn more, watch out for the other articles in this series, or let me know. In any case, you can reach me at magic@thomasralph.com. Thanks to Ivan Petkovic and George Gavrilita for editing and feedback.